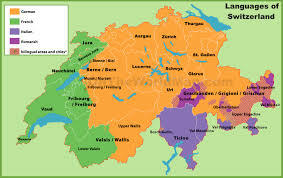 You see the map of Cantons upper left, and they are somewhat like States in the USA. 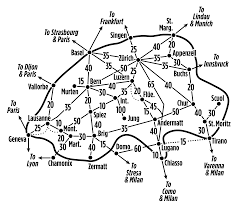 Below that you can derive an idea of the terrain, and on the right the language distribution. Best of all is the Railroad map. Therein lies my principal enjoyment of living in Switzerland. For several years when I lived in the actual city of Geneva, every Friday I would bring my suitcase to the "Gare," the train station where I normally got the bus going up to the International Organization district. I would get my ticket and check the bag into the railroad system. After work, I'd bus to the Gare, board a train to some remote mountain village, collect my waiting luggage, and trundle it to my hotel. Hiking and sightseeing occupied Saturday, and Sunday morning I checked out of the hotel, took my bag to the train station, and enjoyed myself until time to entrain for Geneva where the luggage waited for me. Never once did they lose my bag, and everything worked. I particularly admire the way the leadership of Switzerland is structured so as to prevent any accumulation of undue power, by being a collegial system rather than having one head of state. 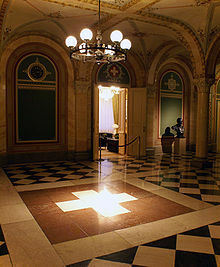 The Federal Council is a seven-member executive council that functions as the head of government. Its presidency and vice-presidency rotates yearly among them, so that no one councillor can impose an extreme agenda but must seek consensus; any rash deed done by one will just be undone by the next President of the Council. Wikipedia states: "The members of the Federal Council are elected for a term of four years by both chambers of the Federal Assembly sitting together as the United Federal Assembly. Each Councillor is elected individually by secret ballot by an absolute majority of votes. Every adult Swiss citizen is eligible, but in practice, only Members of Parliament or more rarely, members of Cantonal governments are nominated by the political parties and receive a substantial number of votes. The voting is conducted in several rounds, under a form of exhaustive ballot: in the first two rounds, anyone can enter their name; but in subsequent rounds, the person receiving the fewest votes is removed from the race until one candidate gains an absolute majority." 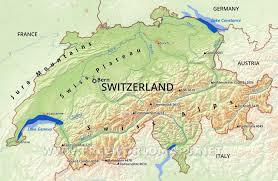 — Switzerland maintains neutrality but is armed to a fare-thee-well. The road tunnels through the mountains have doors leading to armories and field hospitals and who knows what else, and the main tunnel entrances can be sealed. They say, and I believe them, that they could shelter all their citizens in the event of a nuclear war. — Every adult male of appropriate age and ability serves in the reserves every year, pretty much without exception, and so most households have a closet full of soldier gear, including guns and ammunition. — Swiss consulates and embassies have earned undying gratitude for their negotiations between other nations during times of war and otherwise. — Until recently, the way voting was done in one canton was by men gathering in the town square and raising swords to indicate assent. — In those places, until recently, women were not allowed to vote. 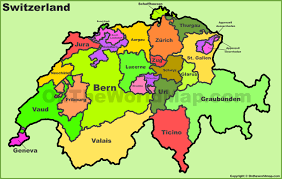 — Switzerland has frequent referendums, binding by majority. — Starting with the League of Nations complex now occupied by the United Nations and locally labeled "The Palais" (well, the restrooms are made of marble, after all), Geneva and its suburbs is home to most International Non-Governmental Organizations (NGOs).